Lawn edgers are used to achieve a neat finish surrounding your lawn, where grass would otherwise outcrop onto asphalt or concrete walkways. Unlike a handheld string trimmer that is designed for more typical use, such as when a lawn mower can’t reach a specific area, an edger is specifically tailored for creating neat edges around your turf. Lawn edgers can be picked up in 3 distinct types: gasoline, corded-electric or cordless-electric powered. Each type of machine has its pro and cons as we will explore below. We’ll also look at the best lawn edgers of 2018. What Makes A Good Lawn Edger ? Our pick of the best cordless edgers available is the Black+Decker LST420. This tool comes with 2 batteries and a charger, so while 1 battery is being charged, you can use the other. It's part of the Black+Decker 20V MAX range, so the batteries & charger are compatible with other outdoor tools from the range. If you prefer a corded electric model, the Black+Decker LE750 is hard to beat. Easy to assemble & operate, lightweight, and with none of the fumes, storage or maintenance issues that come with gasoline-powered equipment, this model also delivers clean edges to your turf. If you need the ultimate power that only a gasoline engine can deliver, have a look at the Troy-Bilt TB516. Surprisingly cost-effective compared to the electrical alternatives, and easier to start than you'd think, this model should be more than adequate for whatever edging job you can throw at it. Cordless lawn edgers (also known as battery-powered edgers) are well-suited to those who are environmentally conscious. They won’t belch out toxic fumes or risk ground contamination like a gas-powered edger. Furthermore, they also do away with the electric cord used by a corded model, which can be limiting and pose a safety or trip hazard. Where cordless lawn edgers suffer is in their running time between charges. This is our favorite cordless edger. As well as coming with 2 batteries as standard, it also has the flexibility to be used as a weed-eater as well as an edger. 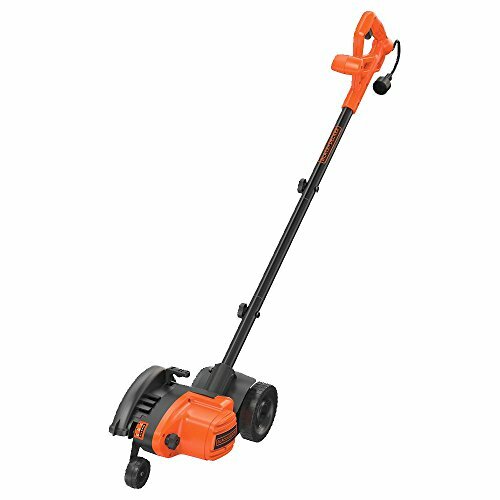 The Black & Decker LST420 manages to overcome one of the key drawbacks of owning a cordless-electric lawn edger, which is the limitation of your battery running flat mid-use. As the product comes with 2 batteries, you’ll be able to finish any job providing both are charged. The only downside is that the charge does take approximately 5 hours. Straight out of the box, the unit is simple to put together, and it even has an adjustable handle height so that it can be used by family members tall or small. It’s also very lightweight. The trimmer speed is adjustable, too, controlling the adjustable string spool that cuts through grass as effortlessly as steel blades would. Finally, it’s worth a mention that the design of this product is such that it can be used as an edger and a trimmer. Whereas many lawn edgers are wheel-mounted, this unit is handheld and lightweight enough to perform both tasks with relative ease. There are two small issues worth mentioning, though they’re only minor niggles. Firstly, there’s no battery indicator, so you won’t know that you’re running out of juice until the machine grows weaker then suddenly dies. Secondly, this model lacks the power of a gas-powered edger, though that’s a trade-off you choose to make when purchasing most battery-powered models. A full 2-year warranty is available from the manufacturer on the machine, with a full replacement being or repair being available free of charge if the product or components are faulty in any way. 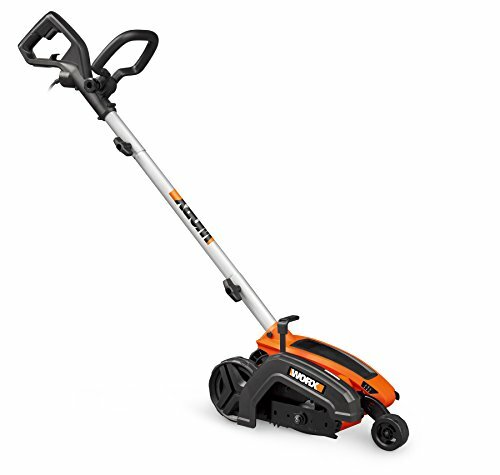 The Black & Decker LST400 is identical to the LST420 above, except it is supplied with a single 4.0Ah battery, instead of the 2 batteries supplied with the LST420. Some users prefer the single battery, however most people prefer to have 2 batteries, so 1 can be in use while the other is charging. 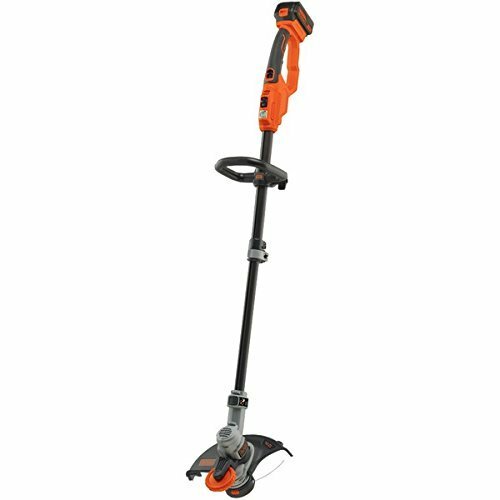 One of the other benefits of this tool is that it is part of Black & Decker's 20V MAX system, whereby the batteries can be used across multiple different tools; ideal for the person investing in a range of garden equipment. Warranty is included for this lawn edger, in the form of a limited 2-year cover. The manufacturer, Black & Decker, covers the product for defects in material or workmanship, offering a like-for-like replacement or repair. This is roughly average for lawn edger warranties. Unlike cordless lawn edgers, the corded variants are not dependent upon a limited charge and will only stop working when you do. The trade-off here is that you’ll be limited in the span of your reach by a cable attached to a power outlet, and you’ll also need to be careful that you don’t trip over or run over the cable. Fortunately, these models also avoid causing air pollution and require minimal maintenance. Assembly of this model is easy and tool-free, and what’s more the machine is compatible with cord extenders, meaning that you can do away with one of the drawbacks of the electric-corded type of lawn edger, which is the limitation of a short cable. In terms of basic functions, the edger has three-position blade depth adjustment to control the height of the cut you want, with an 11-amp motor rivalling some cheaper gas-powered models. The machine is also multi-purpose, with a simple pull-up edge guide converting its function from a lawn edger to a landscape trencher. Though the instructions are reasonably basic, that shouldn’t pose much of an issue, since assembly is straightforward as mentioned above. That said, some users might find difficulty in using the machine on more narrow kerbs owing to wide spacing between the rear wheels. This edger comes with a 2-year warranty from Black+Decker. The Worx WG896 lawn edger exudes simplicity when it comes to assembly out of the box; a straightforward 3 screws put everything into place. The machine also features an extendable edge guide, which aids in closely following the sidewalk or asphalt alongside your turf. The handle is height-adjustable, as are depth settings for the size of the cut, with the motor producing a clean cut that doesn't shred the crass unevenly. Getting used to the machine can be a learning curve owing to the lack of clear instructions, and there are some snags you’ll want to be aware of. Don’t immediately release the handle once you’re done cutting, as the blades will chip your sidewalk if they haven’t finished spinning. The rear blade also tends to catch in longer grass. Gasoline-powered lawn edgers are the most powerful models on offer, though this power comes at a price. In addition to damaging the environment and causing a great deal of noise, they also require the most maintenance of any type of edger. For example, they should never be stored for the winter unless they have been drained of gasoline and oil. 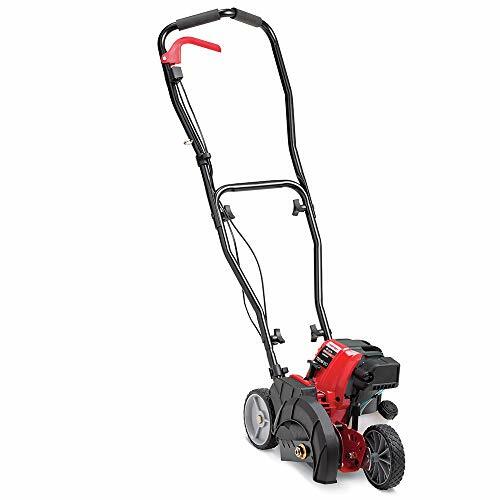 The Troy-Bilt TB516 lawn edger uses a 29cc 4-cycle engine, which means that it runs purely on gasoline, as opposed to a mixture of gas and oil. 4-cycle engines are more reliable, less stressed, and less environmentally damaging than a 2-cycle engine. Assembly is quick and easy, with no tools required. The instruction manual is clear, and refreshingly appears to have been written in English, rather than loosely translated from another language. Its 9" blade can cut a clean edge along sidewalks and driveways, up to 1.75" deep. The cutting height is adjustable between 6 positions, so you should be able to find a height setting to suit your lawn. This machine has Spring Assist Starting Technology, with JumpStart, making it easy to power up with a single, smooth and steady pull. The JumpStart accessory is sold separately, however the machine includes the usual pull start cord as standard. The placement of the choke isn’t ideal and it can be tricky to reach whilst the machine is in operation. Troy-Bilt cover the TB516 with a 2-year warranty. The McLane 801 lawn edger is a larger model than many other edgers, owing mostly to the size and weight of the gasoline engine. However, that engine does boast 3.5 horsepower and 4.75 gross-torque, making it more powerful an option than any of the listed electric or corded-electric models. As a gasoline-powered model, this lawn edger is less environmentally-friendly than electric models. That said, this edger is CARB-compliant, which is the California Air Resources Board's measure of a low-emissions gasoline engine. Although it still produces fumes, it is at least still within the acceptable level deemed by this agency. For entry-level enthusiasts, it’s worth noting that the controls on this gas-powered machine can be confusing. In terms of other drawbacks, the placement of the ignition switch is questionable; fixing it to the engine itself is a hazard when the engine is running hot. 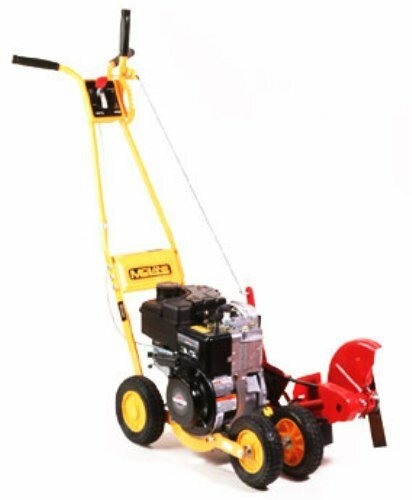 Power: Gasoline lawn edgers have the biggest kick, though you’ll want to weigh up the benefits of more power against the drawbacks these machines have around increased maintenance and pollution. Many electric types can get close to matching gasoline power, so be sure to compare the options. Handheld or wheel-mounted: Whereas some lawn edgers are wheel-mounted and reasonably cumbersome, others can be wielded in one hand, attached to a pole handle. Choose the model that best suits your lawn size and the task at hand, and find one that isn’t too heavy, or using it will become tiring. Wheel positioning: If the wheel positioning is poor, it can make getting close to edges more difficult. For example, inline wheels that sit in line with the cutting edge make it easier to line up the machine against the turf. Poor design can mean a worse end-result. Providing that you stick to brands with a good reputation and track record, such as those listed above, then you needn’t have any major safety concerns around using these devices. Additionally, many more expensive models come with a range of safety features, such as blade guards or automatic shutoffs. Still, you should be aware of the main safety concerns associated with each type of machine. You should always use a GFCI power outlet for any corded electrical equipment being used outdoors, including lawn edgers. Gasoline-powered models can indirectly cause health concerns through the emission of harmful fumes, plus the gasoline is of course a fire hazard. Corded-electric models don’t share this problem, though they pose a risk of tripping or severing a live cable. Finally, cordless-electric models have none of the above concerns and are invariably the safest units, though not necessarily the most practical. Be sure to read the owner's manual that comes with the edger, for further machine-specific safety information. When it comes to maintenance and cleaning of your lawn edging equipment, there are some general principles to follow for all machines, as well as some that are tailored to the type of machine you’re using. All lawn edgers will need to be thoroughly cleaned of dirt and grass after use, before being stored. This will help to prevent more rapid corrosion of the machine components over time. Gasoline-powered models in general should be drained of all machine fluids – gas and oil – prior to being stored away between uses. Corded-electric models should be stored with the cord coiled together and safe from being damaged. Finally, cordless-electric models should be stored with the battery detached, to prevent them from being drained more rapidly. There were no recalls listed for any of the lawn edgers mentioned here at the time of writing (March 2019). However, it's always a good idea to check the latest information at the Consumer Product Safety Commission website before buying any large, expensive or potentially dangerous product. Do you own any of the lawn edgers mentioned here? Did you choose a different one? Let us know in the comments!